Aquatic reptiles (Phylum Chordata, Class Reptilia) are found in marine, brackish, and freshwater environments. Introductions of over 40 reptile species are described herein, most result from privately or commercially owned animals that were released or escaped. Potential impacts of a nonindigenous species can include displacement, reduction, or extinction of native species. An introduced species may be collected and fully eradicated, may fail to become established due ecological or climatic forces, or may become established. 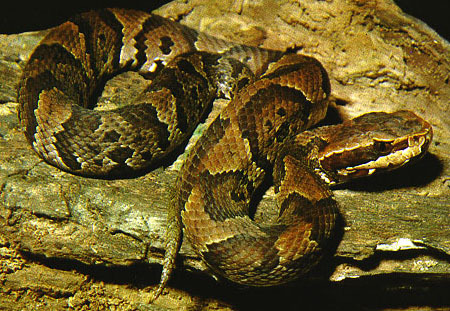 For example, isolated observations of cottonmouths, Agkistrodon piscivorus (pic 89k), and an alligator snapping turtle, Macrochelys temminckii (pic 62k) are believed to be waif introductions of released or escaped pets. The spectacled caiman, Caiman crocodilus (pic 151k), is native to Central and South America and is now established in south Florida; a result of numerous intentional releases or pet escapes dating back to the 1960s. 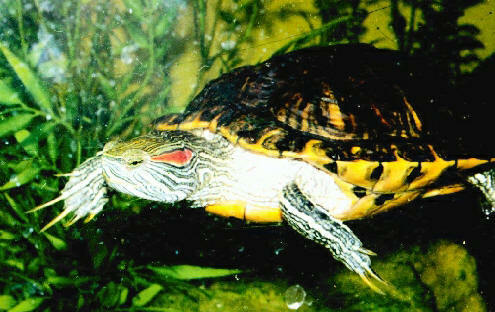 Red-eared sliders, Trachemys scripta elegans (pic 68k), have become established in several areas of the country due to pet releases. Presently any impact effects are unknown. Query the U.S. Geological Survey database to find range maps, photos and profiles for a variety of nonindigenous aquatic species.